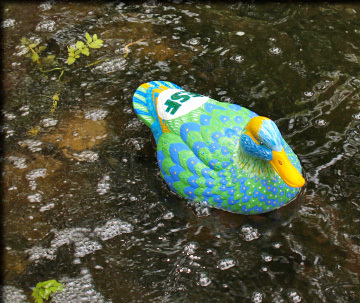 Recognized as "Most Finely Crafted Duck"
SYRACUSE — ESF’s Envira Duck brought honor to ESF by being named "Most Finely Crafted Duck" in the Duck Race to End Racism June 9 at the Syracuse Inner Harbor. Kudos to Wendy Osborne in the Office of Communications for her incredible duck-orating skills. However, Envira Duck showed no interest in shaking her tail feathers to win the race and ducked her responsibility by letting the National Grid duck take the checkered flag. Envira took a decidedly leisurely paddle down the Onondaga Creek raceway. She remained in the middle of the flock the entire race enjoying the company of her fellow lame ducks who also showed no desire to shake a webbed foot toward the finish line. Following the race, Envira Duck was treated well by her duck handler Connor Moore who shared an ice cream sandwich with her (as quackers and milk were unavailable) and later let her spend the afternoon floating in his kiddie pool.